Alison Antelman received First Place in the 2014 Lewton-Brain Foldform Competition for her Metropolis Bracelet. The event is a survey of the evolution of foldforming as it is applied in the world today in large and small scale; in jewelry, sculpture, architecture, functional objects, and unexpected applications. Erica Bello is the winner of the 9th annual Halstead Grant competition for new silver jewelry makers. Bello received a Bachelor of Fine Arts in 2011 at The Rochester Institute of Technology. 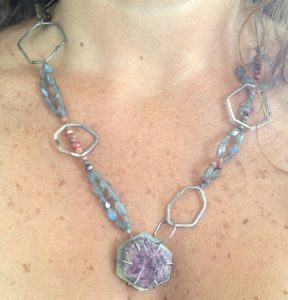 After college she worked as a bench jeweler while she continued to strengthen her customer base for Erica Bello Jewelry. Her geometric silver jewelry with an oxidized finish can be described as industrial, bold and edgy with a three-dimensional dynamic. 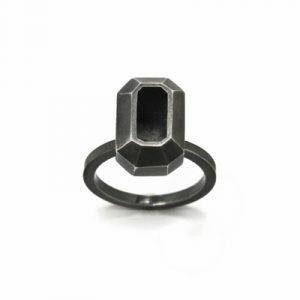 This unique metalsmithing work creates contrast with acute angles and semi-precious stones. Her collection is influenced by architecture and traditional jewelry archetypes. 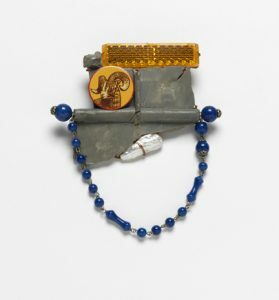 Robert Ebendorf’s work is featured in “The Life and Times of Robert W. Ebendorf: Jeweler and Metalsmith” at the Racine Art Museum in WI through January 18, 2015. Described as a “cornucopia” of information, Ebendorf has spent 50 years creating jewelry, assemblages, and hollowware from metal and found objects. The exhibition offers more than 100 works that represent almost five decades of his creativity. A Fulbright Scholar, Tiffany Foundation Grant Award winner, and founding member of SNAG, Ebendorf’s work is represented in museums around the world. Gayle Friedman’s work was included in “The Grace of Craft” at The Capitol Arts Network in Rockville, MD. The exhibition ran during June 2014. Niki Grandics, San Diego State University, is a recipient of a 2014 Windgate Fellowship in the Jewelry category. Every year, The Center for Craft, Creativity & Design awards $15,000 Windgate Fellowships to ten undergraduate seniors with extraordinary skill in craft – one of the largest awards offered nationally to art students. Anne Havel recently had her work included in two exhibitions: “Winners Circle,” the folllow-up exhibition for all award winners of the Gallery North Outdoor Art Show, and “Unleashed,” Women’s Caucus for Art’s exhibition, Colorado chapter. Havel’s piece haeckel ocean series: spent was featured in the March 2014 Art Jewelry Magazine “Gallery” section. Read what Nicole Jacquard, Namita Wiggers, Karen Lorene, Lauren Selden and others have been doing. If you’d like to join in the conversation go to the Signup Form and we’ll get you into the forum as soon as possible. You can be a part of where the conversation goes next! Daniel Frye, a metal artisan and widely respected teacher who was an art professor at California State University, Sacramento, died in July 2014. 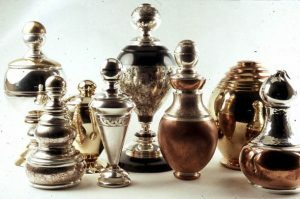 Frye was an accomplished artist in metals before joining the CSUS faculty in 2000. He received awards in national and regional juried competitions, including a 1999 general excellence award at the Newburyport Art Association Craft Exhibition. He exhibited his works in galleries at CSUS and in the community, and he served as a juror for the California State Fair art show. Frye was a member of the Society of North American Goldsmiths. In addition to teaching art education courses, he reinvigorated the metals and jewelry program at CSUS and nurtured connections between the university and the community. He mentored students in the studio and arranged in 2013 to introduce their works to a wider audience with a showing off campus, at The Temp Gallery on Del Paso Boulevard in Sacramento. Popular among students for his talent as an artist and his warm, outgoing personality, he received the 2010-11 Outstanding Teacher Award for the CSUS College of Arts and Letters. As chairman from 2007 to 2013, Dr. Frye kept the art department’s studio programs functioning despite spending cuts. He generated support among regional galleries and donors to enable art students to complete their studies and serve the region as art educators in local school districts and community college. Frye was born in 1955 in Pennsylvania. In a 2011 story in Sacramento magazine, he said his father wanted him to study physics in college, but he preferred the arts – so he earned bachelor’s and master’s degrees in art education from Millersville University in Pennsylvania. He earned a doctorate in teaching and curriculum in 1991 from Syracuse University. He began teaching at the University of Missouri in Columbia. 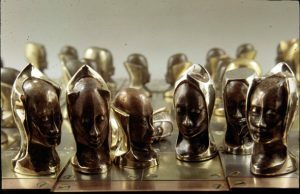 His popular artworks included “Spirit Jars,” a collection of metal containers representing human attributes. He received a jurors award in the 1995 Texas “Hard and Soft” exhibition and a merit award in sculpture at Hoyt National Art Show in 1997. An exhibition of works by Dr. Frye and his students is being planned this fall at the Robert Else Gallery at CSUS. “The Life and Times of Robert W. Ebendorf: Jeweler and Metalsmith” is on exhibit at The Racine Art Museum in Wisconsin through January 18, 2015. Ebendorf has spent 50 years creating jewelry, assemblages, and hollowware from metal and found objects. The exhibition offers more than 100 works. Ebendorf is a founding member of SNAG. Read about this and other exhibitions.